Systemic arterial hypertension is increasingly recognized as a disease that impacts survival and quality of life for small animal patients and, as such, is being diagnosed with more frequency. Patients with hypertension (HT) are often subclinical or demonstrate clinical signs corresponding to another underlying disease process. However, chronically sustained HT can damage the eyes, kidneys, brain, and cardiovascular system; injuries referred to as target-organ damage (Table 1).1-3 The rationale for treating hypertension in dogs and cats is to minimize or prevent these injuries. Diagnosis and management of HT in dogs and cats should be based on the patient’s blood pressure (BP) measurement. Measurement of BP in patients with these conditions is recommended. As many diseases associated with HT occur in older animals, measurement of BP can be part of a geriatric screening profile, typically in dogs and cats over 8 years of age. Cuff choice and placement are important. The width of the chosen cuff should be 30% to 40% of the circumference of the measurement site (Figure 1). Most cuffs have an artery arrow imprinted on them, which does not need to be pointed in the direction of blood flow. However, the arrow should overlie the anatomic site of the vessel in the extremity. Figure 1. Measurement of limb circumference is a critical step in cuff selection. The width of the cuff applied to a site should be 30% to 40% of its circumference. Oversized cuffs give a falsely low value and cuffs that are markedly < 30% of circumference will yield a falsely elevated value for blood pressure. Circumference measurements should be obtained with a flexible metric ruler. Tarsus (where there are numerous ventral, dorsal, and arterial branches). All of these sites provide comparable readings with choice dependent on animal comfort and operator preference. It is ideal for the cuff to be located at the level of the base of the heart because each 1 cm of distance the cuff lies below the heart base causes an artifactual increase of 0.7 mm Hg in the measurement result. In most patients and measurement positions, this artifact is not clinically important. Most commonly, devices that indirectly measure blood pressure are utilized. These devices are usually based on Doppler (Figure 2) or oscillometric (Figure 3) principles. Doppler ultrasonic devices are most commonly used to screen for HT, but choice of measurement device depends on operator experience and preference. Figure 2. 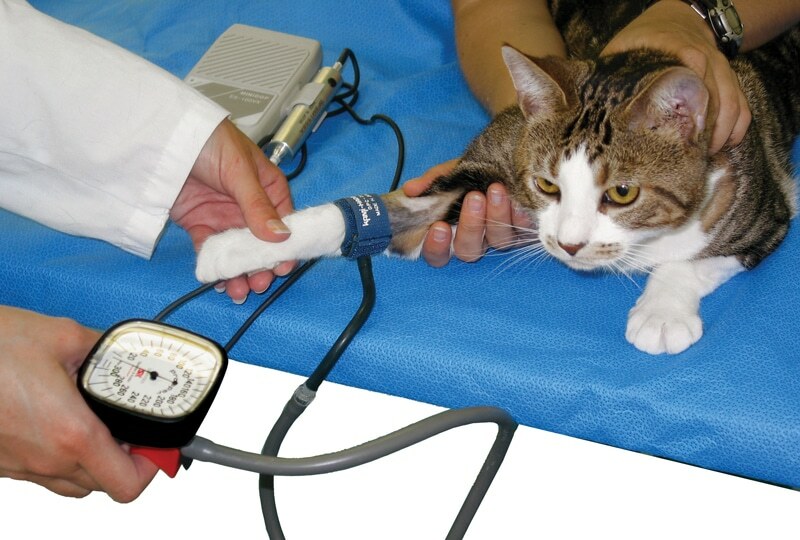 Use of a Doppler principle device to measure systolic blood pressure in a cat. Doppler devices are generally used only for systolic blood pressure measurements; determination of diastolic value is felt by many to be unreliable. The ultrasonic probe is placed distal to the cuff (in this instance on the plantar surface of the paw). While hair is not usually clipped on a limb at the site of cuff placement, clipping hair and application of acoustic gel will often improve the clarity of the ultrasonic probe’s signal. Some technicians attach the probe with white adhesive tape; however, it is generally easier to manually hold the ultrasonic probe in place for conscious blood pressure recordings. It is also helpful to use earphones in order to prevent audible harsh sounds from startling the animal, reducing the reliability of the blood pressure determination. Figure 3. Use of an oscillometric device to measure blood pressure in a dog. These types of devices generally cycle automatically and provide a value for both systolic and diastolic blood pressure. As with the Doppler device, it is recommended to obtain at least 5 readings and average the middle 3 to determine the result of a blood pressure measurement session. It is important to recognize that screening for HT should be conducted in a calm, awake animal in a quiet environment by trained personnel. 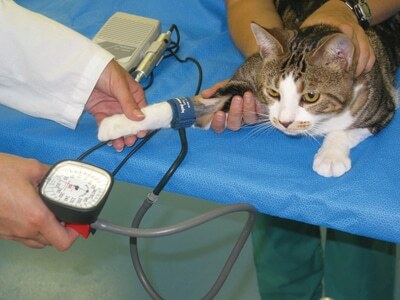 If the animal is distressed, anxious, or struggling during the measurement session, an artifactual increase in BP, referred to as “white-coat HT” can occur. Such measurements are considered unreliable. At least 5 measurements should be taken. The readings giving the highest and lowest value for systolic BP should be discarded with the final result determined as the average of the remaining 3 or more values, as long as these remaining systolic BP results are within 20 mm Hg. If the remaining systolic BPs differ by more than 20 mm Hg, the measurement session should be repeated. 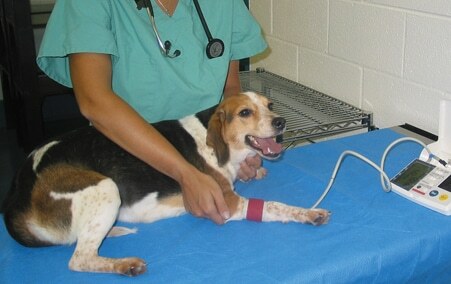 It is customary to conduct at least 2 measurement sessions, separated by 30 minutes or more, before concluding that an animal is in need of antihypertensive therapy. Determining if there are any concurrent conditions that may complicate antihypertensive therapy (eg, heart or kidney disease). Because HT is often a silent, slowly progressive condition requiring vigilance and life-long therapy, it is important to be absolutely certain about the diagnosis. A decision to use antihypertensive drugs should be based on the BP stage (Table 2) and integration of all clinically available information. The ultimate goal of therapy is to minimize target-organ damage while providing a good quality of life. In people, any reduction of BP that does not produce overt hypotension lowers the risk of target-organ damage. This finding remains to be confirmed in dogs and cats but both the American College of Veterinary Internal Medicine (ACVIM) Hypertension Consensus Panel 3 and the International Renal Interest Society (IRIS)4 recommend that BP be categorized on the basis of risk of future target-organ damage (Table 2). Although interbreed differences in BP exist in dogs, only the difference for sighthounds (20 mm Hg higher values for each category) mandates separate categorization at present. The general consensus is to institute therapy in a patient with evidence of target-organ damage (Table 1) if reliable measurements of BP indicate that systolic BP (SBP) exceeds 160 and/or diastolic BP (DBP) exceeds 100 mm Hg (AP2 or AP3). Antihypertensive therapy must be individualized to the patient and concurrent conditions. Regardless of the initial BP, the ideal goal of therapy would be to reduce the risk of future target-organ damage to substage AP0 (SBP < 150 and/or DBP < 95 mm Hg).3,4 The response to effective antihypertensive therapy is typically a 25 to 50 mm Hg decline in BP. The minimal goal is to reduce the risk for target-organ damage by lowering the patient to a new stage. In a hypertensive crisis, where severe ocular or central nervous system target-organ damage is present, emergency treatment requires immediate reduction in BP. However, in other circumstances, BP reduction should be achieved with gradual, persistent lowering of BP over several weeks. The initial therapeutic choice is often an angiotensin-converting enzyme inhibitor (ACEI).3 The starting dosage should be at or above the lower end of the recommended range (Table 3). The upper limit of the recommended dosage for ACEIs is controversial as some experts will stop at this dosage and consider adding a different agent, typically a calcium channel blocker (CCB), while others will increase the ACEI dosage further. If an antihypertensive agent of choice is only partially effective, the usual approach is to increase the dosage and, if still ineffective, then add another drug. 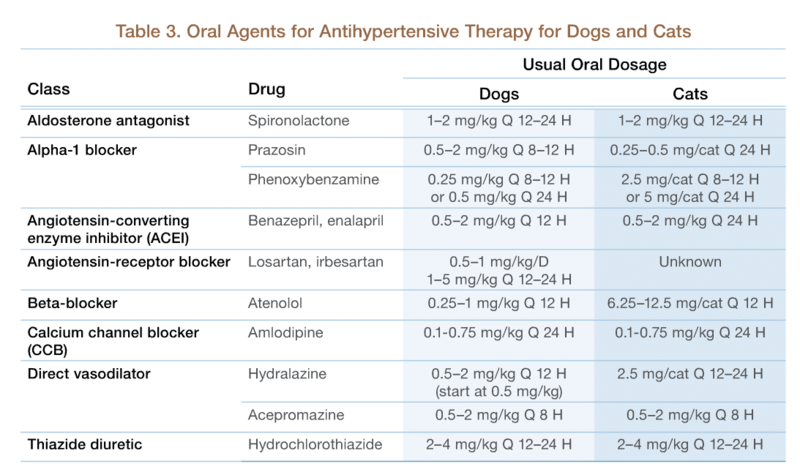 While not ideal, many dogs with significant hypertension will require more than 2 agents. Aldosterone-receptor blocker (eg, spironolactone) or surgical excision for primary hyperaldosteronism. Diuretics (eg, hydrochlorothiazides) are not commonly used, but may be useful, especially in patients with concurrent hypertension and nephrotic syndrome. Angiotensin-receptor blockers represent a newer class of agents that block the binding of angiotensin II to its receptors, having similar overall effects to ACEIs. At this time, the effects and safety profiles of these drugs in dogs and cats are not well known. However, dosage recommendations are available for dogs (Table 3). Second choice agents, particularly in proteinuric cats, would be an ACEI. Many experts recommend a CCB as initial therapy in hyperthyroid cats with HT, adding a beta-blocker if additional antihypertensive efficacy is needed. It is important to remember that hyperthyroid cats are more likely to have HT after therapeutic intervention to lower their thyroid hormone levels, perhaps due to an associated worsening of renal function. An exception to the above gradual approach, where substantial time (weeks) is allowed between dosage adjustment, is animals with AP3 and evidence of severe or progressing neural or ocular target-organ damage. A direct vasodilator, such as nitroprusside or hydralazine, is an alternative treatment choice in hypertensive emergencies. The goal of emergency treatment in either species is to reduce BP within hours to slow rapidly progressing ocular or neural target-organ damage, adjusting dosages within that time frame as necessary. While available evidence suggests sodium restriction alone generally does not reduce BP, high salt intake may produce adverse consequences in some settings. Therefore, low-salt diets are recommended for hypertensive patients. In most situations, HT is not an emergency and 3 to 4 weeks should be allowed between dosage adjustments. A dog in IRIS Stage 1 or 2 chronic kidney disease (CKD) should be evaluated 3 to 14 days after any change in antihypertensive therapy. In unstable patients and those with IRIS Stage 3 or 4 CKD, this recheck should be conducted earlier, perhaps within 3 to 5 days. Patients deemed to be hypertensive emergencies and hospitalized patients, particularly those receiving fluid therapy or pharmacological agents with cardiovascular effects, should be assessed daily or several times daily depending on severity of crisis. The purpose of these short-term assessments is to identify findings that are unexpected (eg, new or worsening target-organ damage) or adverse effects (eg, marked worsening of azotemia or systemic hypotension). Clinical findings of weakness or syncope coupled with a BP < 110/60 mm Hg indicates systemic hypotension and therapy should be adjusted accordingly. Hypotension is uncommon if the initial diagnosis of HT was correct. There has been some concern about acute exacerbation of azotemia with ACEI therapy, but this is unusual and modest increases in blood creatinine concentration (< 30%) are generally tolerable. Re-evaluation is appropriate at 1 to 4 month intervals, depending on stability (more frequent if BP or other conditions are unstable) and degree of hypertension (more frequent if BP remains > 180 mm Hg). Any other specific evaluations depending on circumstances (eg, target-organ damage, causes of secondary hypertension, concurrent conditions). A key predictive indicator of antihypertensive efficacy is its effect on proteinuria: a benefit is predicted if the antihypertensive regimen is antiproteinuric (eg, normalizes the urine protein:creatinine ratio to < 0.2 or reduces the ratio by at least 50%). Frequency of dosage adjustment to antihypertensive therapy. Since signs of progression of target-organ damage can be subtle, BP should be closely monitored over time in patients receiving antihypertensive therapy, even when HT is seemingly well-controlled. Brown SA, Henik RA. Diagnosis and treatment of systemic hypertension. Vet Clin North Am Small Anim Pract 1998; 28(6):1481-1494. Stepien RL, Henik RA. Systemic hypertension. In Bonagura JD, Twedt DC (eds): Kirk’s Current Veterinary Therapy XIV. Philadelphia: WB Saunders, 2009, pp 713-717. Brown S, Atkins R, Bagley A, et al. Guidelines for the identification, evaluation, and management of systemic hypertension in dogs and cats. J Vet Intern Med 2007; 21:542-558. Elliott J, Watson ADJ. Chronic kidney disease: Staging and management. In Bonagura JD, Twedt DC (eds): Kirk’s Current Veterinary Therapy XIV, 2009, pp 883-892. De Caterina AR, Leone AM. Why beta-blockers should not be used as first choice in uncomplicated hypertension. Am J Cardiol 2010; 105:1433-1438. Snyder PS, Cooke KL. Management of hypertension. In Ettinger SJ (ed): Textbook of Veterinary Internal Medicine. Philadelphia: WB Saunders, 2005, pp 477-479. Henik RA, Stepien RL, Wenholz L, et al. Efficacy of atenolol as a single antihypertensive agent in hyperthyroid cats. J Feline Med Surg 2008; 10:577-582. Brown S. Hypertensive crisis. In Silverstein DC, Hopper KA (eds): Small Animal Critical Care Medicine, St. Louis: Elsevier, 2008, pp 176-179. Amy Dixon-Jimenez, DVM, is a cardiology resident in the Department of Small Animal Medicine & Surgery at the University of Georgia College of Veterinary Medicine. She shares an interest in the diagnosis and management of systemic hypertension with her coauthors. Gregg Rapoport, DVM, Diplomate ACVIM (Cardiology), is an assistant professor of cardiology in the Department of Small Animal Medicine & Surgery at the University of Georgia College of Veterinary Medicine. Prior to his current position, he was a staff cardiologist at Angell Animal Medical Center, Boston, Massachusetts, and before then, a staff cardiologist at Michigan Veterinary Specialists, Southfield, Michigan. Dr. Rapoport received his DVM from University of Wisconsin and completed a small animal rotating internship at The Animal Medical Center, New York City, and a cardiology residency at University of Wisconsin. Scott A. Brown, VMD, PhD, Diplomate ACVIM, holds joint appointments in the Departments of Small Animal Medicine & Surgery and Physiology & Pharmacology at the University of Georgia College of Veterinary Medicine and is a Josiah Meigs Distinguished Professor. His research interests are focused on nephrology and systemic hypertension and he has published over 150 articles and book chapters on related topics. Dr. Brown has received the University of Georgia’s Creative Research Medal, AVMA’s Excellence in Research Award, Royal Canin Award, and National Norden Distinguished Teacher Award. He received his veterinary degree from University of Pennsylvania and completed an internship and residency in small animal internal medicine at UGA, where he also received a PhD in renal pathophysiology. Dr. Brown completed a postdoctoral research fellowship at the Nephrology Research & Training Center of the University of Alabama’s School of Medicine.